Home / Getting Started / What's New in Cascade 8? Cascade 8 introduces a redesigned and reorganized interface, an upgraded WYSIWYG editor and some differences in functionality. A few of the highlights are outlined below. 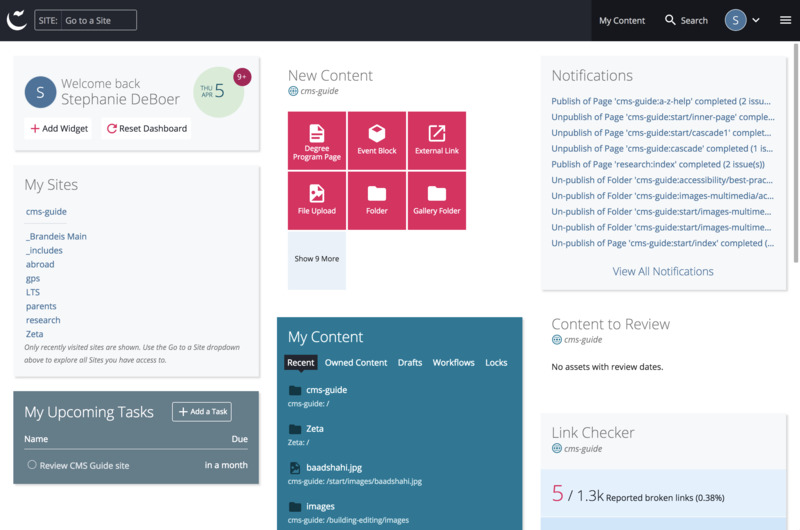 The Cascade CMS interface has a new look and feel with larger fonts, bold colors and customizable widgets. The New menu has been replaced by the Add Content menu. To add new assets to your site, you will click the pink circle with a plus sign. The icons for pages, blocks, files and external links are now gray or black. Folder icons remain yellow. To preview the contents of a folder, click on the name of the folder. To select and open a folder, hover to the right of the folder and click the right-facing arrow ( > ). The contents of the folder will display in the main part of the screen. To add new content to a folder, you must first click the arrow to select it. The WYSIWYG editor has a fresh look. Formatting options like headings and custom styles are in different places. 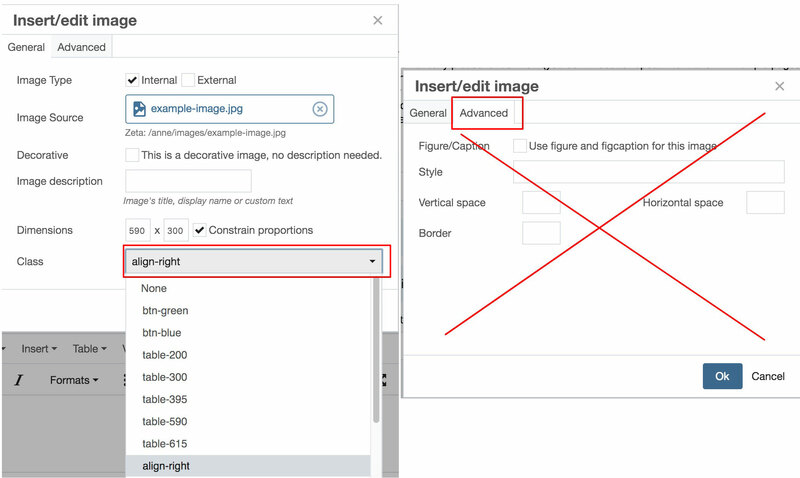 If you previously used the Advanced tab in the Insert/Edit Image editor to align an image inline with your text (those in the Zeta templates and others), you will no longer use this Advanced tab. Instead, select "align-right" from the Class dropdown when inserting an image. Using the align-right class also gives your image vertical and horizontal space, so leave those fields in the Advanced tab blank. The System Name field has been replaced by Page Name (or File Name or Link Name). The name in this field also appears in the URL of the page or file. In the previous system, you would click the Submit button to save an asset. Now, the steps are different and we encourage you to review Submitting a Page before you need to submit a page. 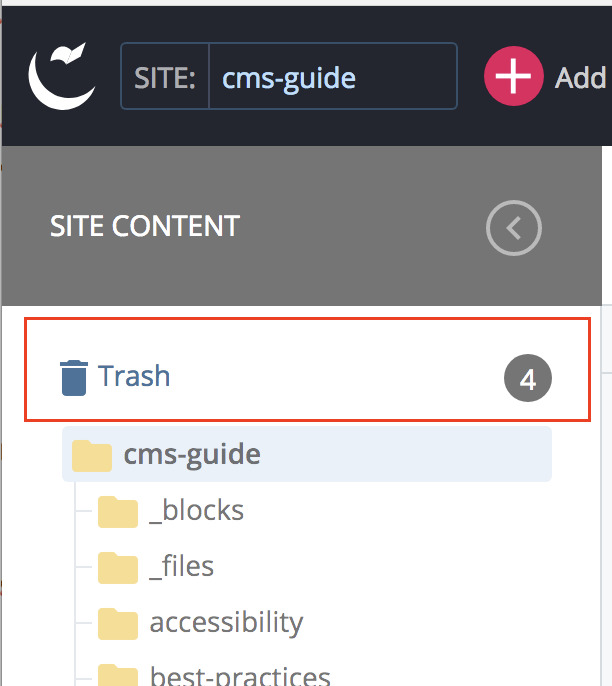 The Trash (formerly Recycle Bin), which contains deleted assets, is now located in the Site Content Menu. Assets can still be restored for 15 days from the Trash. Message banners notifying you that an action was completed successfully now appear at the bottom of the screen instead of at the top. In Cascade 8, individual user dictionaries have been replaced by a single system-wide dictionary. The Web Team has imported many words into the system-wide dictionary, but you may submit your requests to us for review. 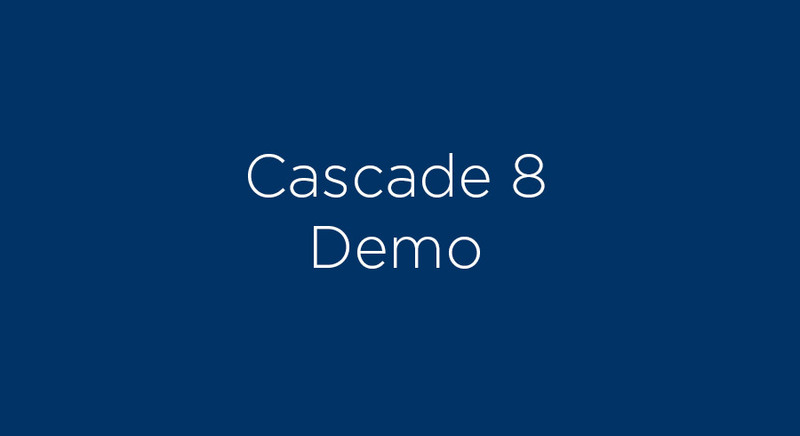 This video provides an overview of the Cascade 8 system and highlights specific changes.